I featured this body lotion on a haul post a few weeks back and it has quickly become one of my favourite scents. I use the White Musk perfume in another scent, and I think this is a lot newer than that one, but I love this one already. It's very musky and smells amazing! I keep smelling myself whenever I wear it because it smells that good. The Body Shop's website describes it as a 'blend of cruelty-free musk, tobacco flower and notes of black rose.' It leaves my skin feeling amazing and is definitely worth the £10 pricetag. This nail polish came in an Essie nail set (Favourites to Fall For), I can't seem to find it on the Boots website, and it's sold out on Superdrug's website, but it's £7.99. Apparently, according to Superdrug, it was a breakthrough shade because it was the first true greige - that might mean more to you than it does to me! It's just a really nice shade, I don't usually go for shades like this but it is very sophisticated! You will have seen this in my 'Spotlight' post for Soap & Glory. I've been using it for over a month now and it is truly amazing! I wanted to use it for quite a while before I shared my opinion on it. My skin has improved so much since I've been using it - it's clearer and less oily. It's £9 which is quite expensive for a face wash but I now know it's totally worth the money. I've mentioned my oily skin on here before and discovered that pressed powders are pretty good at combating excess oil. 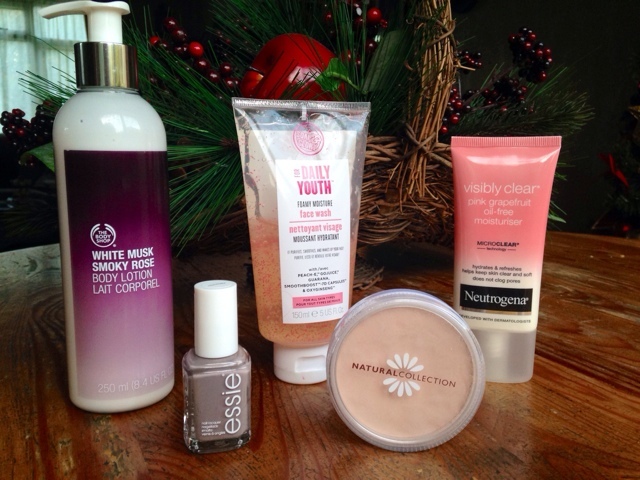 Natural Collection is slowly becoming a favourite brand of mine because it is so affordable! Most of their cosmetics are £1.99 (maybe it's all of their products but I'm not quite sure). I apply this powder with a standard kabuki brush from Superdrug. My face stops looking so greasy at work, which is a massive improvement! I was getting bored of my moisturiser because it didn't seem to be doing anything for my skin. I wanted an oil free moisturiser with a nice smell and that's where Neutrogena's Pink Grapefruit range came in! It doesn't clog my pores at all, which is a massive bonus considering I suffer from adult acne (although not that badly anymore). This, paired with the S&G face wash, has left my skin feeling so much better during these bitter cold months. It's good value for money at £4.99, I cannot recommend enough! Ooh we love the Essie nail polish & completely agree this shade is super sophisticated. The 'Neutrogena Pink Grapefruit Oil-Free Moisturiser' sounds fab! great favourites! the body shop lotion sounds like it would be a nice scent for this time of year! very pretty shade of nail polish as well! I love White Musk! Has to be my favourite scent from the body shop!